PCM’s Food Pantry assists an average of 500 households a month by providing a few day’s worth of groceries in times of crisis. (There is a limit of 5 visits per household per calendar year.) Food donations tend to lighten after the holidays. Thankfully, PCM is supported by some very faithful people who do what they can to keep the food pantry stocked. If it’s been a while since your congregation or group has donated food or financial support, we could really use you right now! Let us know if you have questions about where to pick up or even begin! 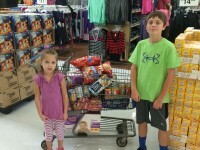 No Comments to "1st Quarter Food Pantry Assignments – Happy New Year!"